Are you receiving emails in your Webmail account? 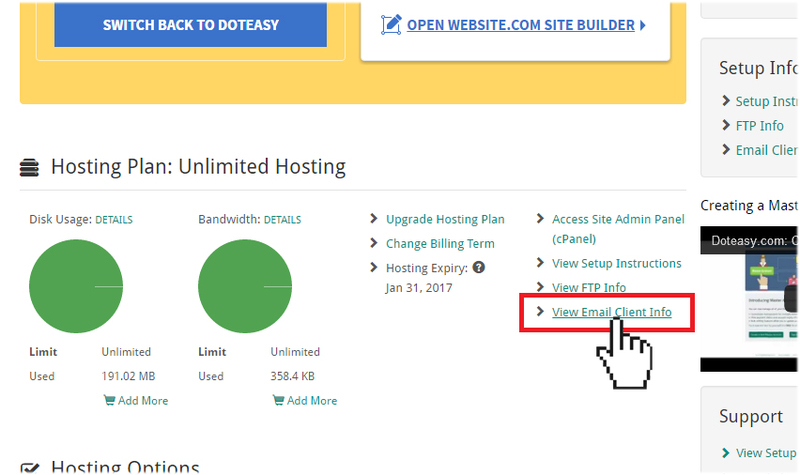 The first thing you need to do is to find out if the problem is with your email account or your email client, and the easiest way to do so is to log into your Doteasy Webmail account and see if you are receiving all incoming emails. If you are receiving emails in your Webmail account, then you can proceed with the steps outlined in this article. However, if you are not receiving incoming emails in your Webmail account, please refer to our article How to troubleshot problems receiving emails in Webmail for more information. Is your email client configured correctly? Solution: Review your email client’s basic configuration to make sure all settings are correct, including username, password and incoming mail server settings. When setting up your email client (ie. Outlook, Mac Mail and Thunderbird) for your domain email account, you need to make sure the incoming mail server settings and ports, as well as username and password are correct. If these settings are incorrect, you will still be able to receive your emails via Webmail, but you won’t be able to receive them in your email client. Do you have the correct incoming mail server name? Make sure you are using the correct server for incoming emails. Are you using POP3 and have accessed your emails from another device or email client? Solution: If you are using multiple devices to check your emails, you may want to use IMAP instead of POP3. While both POP3 and IMAP are protocols used to handle incoming emails, but they differ in the way your incoming emails are synchronized at the mail server level. POP3 works by delivering your email straight to your inbox so that it can be downloaded onto your computer or device. In the typical POP3 setup, emails will be removed from the mail server once it is downloaded onto your computer or device. In other words, your emails are tied to the specific device you used to access the emails – once the email is downloaded onto one device (and removed from the mail server), it cannot be accessed by another email client or device. On the other hand, IMAP simply means you are connecting to your mail server with your email client. When doing so, you are managing the emails directly on the mail server – no emails are downloaded to your mail client or device. Because of this, IMAP makes it possible to access your emails from different devices and all changes are made at the mail server level. It doesn’t matter which email client or device you are using, you will always connect to the same account on the mail server and you will see the same emails. While Doteasy offers both POP3 and IMAP, we recommend using IMAP as it gives you the flexibility to manage your emails from multiple devices or email clients and at the same time, providing peace of mind that if anything should go wrong with your device, you can still access your emails from another device. For more information on the differences between POP3 and IMAP, please check out our article POP3 vs. IMAP – Which one should you use?. There might be a delay in the delivery of your email. Solution: Check your email inbox again in a few minutes or hours. It is a common misconception that email delivery is instant – when emails are sent, it goes through a network cloud (such as the Internet) that is made up of a multitude of mail servers, servers, routers and other devices and services. Unfortunately, these devices and services will become slow if there should be a heavy load, or temporarily unable to transmit the email if it is down for maintenance. For example, if there is a high volume of email in the queue, either because there are many messages or the message are unusually large, the email will be delayed in the queue. In other words, there is a chance that your email message is only delayed, not lost. It is impossible to guarantee a delivery time for email – even though it seems email messages are delivered instantly, there are those rare circumstances that it can take hours or even days before a message is delivered to your inbox. If you have followed the steps above but you are still unable to receive incoming emails in your email client, please contact us so we can help you further investigate and rectify the problem.